Thank you so much for sharing, Laura. You’re right. People’s insensitivities are almost always not inentioned to be as they are. Thank you for sharing your story. Oh boy, I could spend hours on this one. The fact that Colin and I are related and do share some resemblance only makes it easier for people to assume that he is my son. Not to mention the fact that we act like mother and son and pretty much have since he was born even though I didn’t get custody of him until he was two and a half. Since his parents have become a regular part of our lives again it only adds to the odd looks when we’re out and about and he calls them “mom and dad”, yet I’m the one who parents him. One of the things I have struggled with is when people ask him if he is mine – well of course he is! But the implied meaning in that question refers to mother/son, not aunt/nephew. It gets even better when people refer to me as his mom and he corrects them – “that’s my Jenn” is his usual response. When people ask my mother about her family she tries to sort of the dynamics and would probably benefit from a flow chart to aid in the explanation. What is now the norm for us can sound absolutely foreign to others. I think we all need to remember that such a simple question or inquiry can bring to the surface many different thoughts, feelings and reactions. Ten years ago we were a normal family by most standards, four years ago we became anything but that. And when I look back over what’s transpired I think we’re the better for it, pain and all, yet it’s not something I necessarily want to rehash, particularly in front of the sweet little boy who’s in the middle of it. Wow, Jenn… such poignant words and sobering reality to serve as an exclamation point to my post. Thank you so much for sharing. You are a tremendously special human being, aunt, and mom. Thank you for allowing your heart to be shared. You are extraordinary! Thank you so much for putting our family out there. Sometimes it can be hard to know how it will be received, but I am honored to have our family recognized exactly how it is, and especially the acknowledgement of Catherine Elizabeth, who despite her short time with us changed lives forever. It is true that my mood dictates if I want to share Catherine, and it is always a struggle when I choose not to, as she is such an important part of our lives and VERY MUCH my daughter. I often remark at how easy it is for her big sister Maggie to say: “Yes, I have a sister Catherine in heaven ” when asked if she has any brothers or sisters. And I often envy her ability to disregard how the questioner will feel and to acknowlege her baby sister, despite the fact that she only got to see her for a short time the day she came to this earth and went to heaven. The most important thing though is that lives have been touched by her even if they have never met her and her legacy continues and changes continue to happen because of her. Love you baby girl!! Indeed BOTH of your precious daughters have touched many lives — mine and Skip’s included. They are a reflection of the unconditional love you and Michael pour out every day. I love you, my friend. And of course, there are those of us who refer to others’ kids as if they belong to me/us. 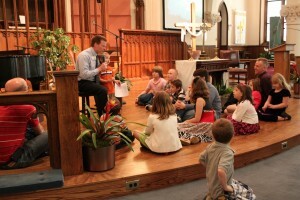 (See the photo of me with “our kids” at Christ Church!) That’s the “It takes a village” philosophy. Yes! Those kids DO all “belong” to you, Kenis. You are loved!! Thank you for all you do for so many of our children.